A construction team at one of these amusement parks was handed down an alteration that needed to take place to account for an addition they had not initially planned on. Basically, they needed to drill for anchors into a structural column to add some metal plates. They needed to make sure they abided by the requests for the changes without undermining the integrity of the structural steel. Being well acquainted with Ground Penetrating Radar Systems the supervisor reached out to them and had them come out to scan for the structural steel (rebar) prior to drilling. After arriving on site, the construction team had already had a boom lift brought into the area so that the GPRS professional could access three columns from top to bottom. The GPRS professional pulled out the GSSI SIR 3000 with a palm antenna. Palm antennas are great from concrete scanning when scanning overhead, close to walls, or any other tight areas. GPR is used to scan for most subsurface elements, but in this case, it was being used to map out structural steel or rebar. The team member scanned all three columns from top to bottom and all the way around. While scanning they marked out the rebar with markers to give the team a visual of where the steel was located. Once the areas were scanned the construction team consulted with the engineers about where the plates would need to go. Based on the findings from the scanning they were able to come up with an informed plan. After all was said and done, they were able to install the new metal plates without undermining the integrity of the structural steel. 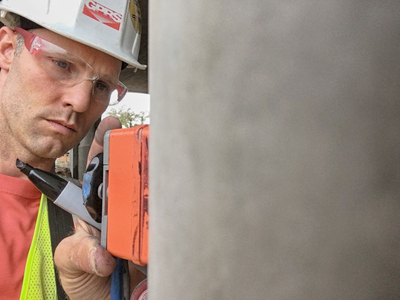 The picture above depicts Nate Schmoe, of GPRS, scanning the columns with the palm antenna. If you would like to receive a proposal for similar work please visit the “Contact-Us” page at gp-radar.com.